Sorry Vinny, but I would not trust you one bit with my kids. 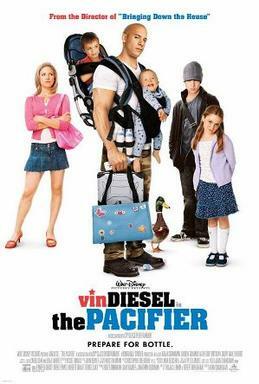 Tough-guy Navy SEAL Shane Wolf (Vin Diesel) never imagined that he’d wind up as a babysitter for a crop of unruly kids. But now that he is, he’s shocked to discover that it’s the hardest job he’s ever had in his life. His mission, which he has no choice but to accept, is to protect the children (including Brittany Snow, Max Thieriot and Morgan York) of a scientist who was killed while working on a top-secret government project. Basically many of Hollywood’s big-time action stars have to do it. Arnold in Kinder garden Cop, The Rock in The Tooth Fairy and Game Plan, and most recently Jackie Chan with The Spy Next Door. Vin Diesel follows those foot steps. The film follows all the same exact formulas would expect from a film of this nature. From the diaper-changing scene, to the fart jokes, and to the very dumb plot twist in the middle of the film. I mean the film doesn’t even try to give an effort to make anything different or fresh, it’s just the same old formula used. The script is really bad here as almost every single cliched line you can think of, well it plays out the same exact way in here. The main problem with this film is that Disney was behind it. In the first few minutes several people are blown up or shot including the father and lead of the film. Within a few minutes, all this is forgotten and the bad diaper jokes start. With its very aimless direction I didn’t feel like this film was inspired at all. Diesel, much to his charm actually brings this film up a couple of notches. I mean I will say he uses his charm very well, and for a lot of the scenes it looked like he was game for the most part. I liked how he was able to play a parody of the character people think of him always playing, and I give him a lot more respect because of that. Consensus: Vin Diesel’s charm works a bit, but cannot overbear this un-original, formulaic, and overall non reasonable film. I cannot believe that this movie issued two spinoffs, “The Tooth Fairy” and “The Spy Next Door”. The formula doesn’t work, people. Glad I wasn’t into The Pacifier, it would the worst of the bunch to watch at folly. Vin Diesel should not be taking part on that family-oriented movie and Sylvester Stallone should have been the top star.